Objective To develop and evaluate the effectiveness of a community behavioural intervention to prevent weight gain and improve health related behaviours in women with young children. Setting A community setting in urban Australia. Participants 250 adult women with a mean age of 40.39 years (SD 4.77, range 25-51) and a mean body mass index of 27.82 kg/m2 (SD 5.42, range 18-47) were recruited as clusters through 12 primary (elementary) schools. Intervention Schools were randomly assigned to the intervention or the control. Mothers whose schools fell in the intervention group (n=127) attended four interactive group sessions that involved simple health messages, behaviour change strategies, and group discussion, and received monthly support using mobile telephone text messages for 12 months. The control group (n=123) attended one non-interactive information session based on population dietary and physical activity guidelines. Main outcome measures The main outcome measures were weight change and difference in weight change between the intervention group and the control group at 12 months. Secondary outcomes were changes in serum concentrations of fasting lipids and glucose, and changes in dietary behaviours, physical activity, and self management behaviours. Results All analyses were adjusted for baseline values and the possible clustering effect. Women in the control group gained weight over the 12 month study period (0.83 kg, 95% confidence interval (CI) 0.12 to 1.54), whereas those in the intervention group lost weight (−0.20 kg, −0.90 to 0.49). The difference in weight change between the intervention group and the control group at 12 months was −1.13 kg (−2.03 to −0.24 kg; P<0.05) on the basis of observed values and −1.11 kg (−2.17 to −0.04) after multiple imputation to account for possible bias created by missing values. Secondary analyses after multiple imputation showed a difference in the intervention group compared with the control group for total cholesterol concentration (−0.35 mmol/l, −0.70 to −0.001), self management behaviours (diet score 0.18, 0.13 to 0.33; physical activity score 0.24, 0.05 to 0.43), and confidence to control weight (0.40, 0.11 to 0.69). Regular self weighing was associated with weight loss in the intervention group only (−1.98 kg, −3.75 to −0.23). Conclusions Weight gain in women with young children could be prevented using a low intensity self management intervention delivered in a community setting. Self management of health behaviours improved with the intervention. The response rate of 12%, although comparable with that in other community studies, might limit the ability to generalise to other populations. Trial registration Australian New Zealand Clinical Trials Registry number ACTRN12608000110381. Obesity treatment and prevention are major issues in developed nations. In Australia, 60% of adults are overweight or obese, and many other countries show similar prevalence.1 2 Treating established obesity and related diseases has proved challenging and costly, and requires a skilled workforce, intensive ongoing education, and counselling.3 These approaches are associated with high dropout rates and limited long term efficacy. In response to the increasing prevalence of obesity, the World Health Organization has recommended that prevention of overweight and obesity in adults should include efforts to avert further weight gain, even when body mass index is within an acceptable range.4 Preventing excess weight gain is a vital target, both from a population health perspective and through economic necessity. Few trials have specifically aimed to prevent weight gain, and there is insufficient evidence that current interventions to curb weight gain in adults are effective.5 Studies of lifestyle interventions in high risk populations, however, have provided valuable evidence for the positive effect of lifestyle changes on weight. These interventions are associated with important health benefits through modest weight change but are complex, labour intensive, and costly.6 7 The high cost of many lifestyle interventions has led researchers to investigate mail and phone interventions, which have had disappointing effects in weight loss trials but may hold promise for weight gain prevention.8 The key components contributing to the success of complex lifestyle interventions have not yet been clearly identified, however, nor is it clear which components are applicable to prevent excess weight gain in healthy populations. Women of reproductive age present an important target group for such interventions because they experience a high rate of weight gain (mean 650 g/year) and have considerable barriers to participation in obesity protective behaviours.9 Their importance as a target group is increased by their influence on the lifestyle behaviours of family members such as partners and children, hence targeting such women could potentially increase the reach of interventions.10 11 In the absence of feasible, successful interventions, there is a need for effective low intensity, community based, lifestyle interventions to prevent weight gain in women. The primary aim of this study was to determine whether a low intensity, self management intervention prevents weight gain in women in the community compared with a control group of women receiving population guidelines on diet and physical activity. Secondary aims were to examine the effect of the intervention on biochemical outcomes, physical activity, energy intake, self management behaviours, and self confidence in weight management. The effect of self monitoring on the efficacy of the intervention was also examined. The setting for recruitment for the study and delivery of the intervention was primary (elementary) schools in urban Australia, which teach children aged 5-12 years. This setting supports a collaborative multi-sector approach, builds on existing social connections, and uses existing community resources. All government primary schools within this community were identified (n=22) and invited to participate, firstly by mail and then by a meeting with the principal. Of the first 14 schools approached, 12 agreed and were recruited. We then stopped recruiting schools because we estimated that a sample size of 12 schools would allow us to meet the required participant number. We anticipated that the size of the school might have an influence on the participation rates and outcomes; therefore, we paired the schools on the basis of size, with each pair randomised to intervention (n=6) or control (n=6) by using computer generated numbers. The random allocation sequence was generated by one team member and verified by a second team member. All schools were allocated to a study group in a single batch before recruitment of participants. All women with a child attending one of the 12 schools (n=2560) received a generic invitation attached to the regular school newsletter that invited them to participate in a healthy lifestyle programme to be held at the school. Women could respond by mail, telephone, email, or in person, thereby reducing the opportunity for selection bias. Potential participants were excluded if they were pregnant, breastfeeding infants under 6 months of age, taking prescribed weight control medications, wished to gain weight, or had a serious physical or psychological condition that might affect their ability to complete outcome measures or to participate fully. To ensure our study was inclusive of the whole community, participants were not excluded on the basis of body mass index (with the exception of underweight women). From May 2006 until August 2006, women were assigned to the intervention group or the control group according to the cluster allocation of their school. No incentive to participate was provided. Follow-up was completed in October 2007. Participants were blind to group allocation status. Ethical approval required all participants to be informed of the study aim—to improve lifestyles and prevent weight gain. The dietitian who delivered the intervention could not be blinded to treatment allocation. Team members involved in data collection and management were blind to group allocation and did not participate in intervention delivery. Ethics approval was granted through the Southern Health Human Research Ethics Committee, and all participants signed an informed consent form. The intervention was based on social cognitive theory, more specifically: goal setting; self monitoring; social support; problem solving; and training to prevent relapse.13 It focused on behaviour change skills related to diet and physical activity but not specifically related to weight loss. We did not use prescriptive or individualised energy restriction or expenditure goals. Participants attended four one hour group sessions (weeks one, two, three, and 16) with 10-30 participants at the local primary school. The intervention was designed to be delivered by a trained facilitator; in this case a single dietitian delivered all group sessions. At session one, participants were weighed, measured, and completed baseline questionnaires. Simple messages on dietary intake, physical activity, and behavioural strategies were introduced. The messages and session content are described in box 1. At the following two group sessions, participants discussed personal goals, outcome expectancies, and relapse prevention; identified problems and barriers to behaviour change; and prepared personal action plans. Women were encouraged to join voluntary school based walking groups or to walk with friends, were given a pedometer to keep as a voluntary self monitoring tool, and asked to weigh themselves regularly. At 16 weeks, the intervention group met again and participants were measured and completed a brief questionnaire, and the programme behaviour change skills were reinforced. Facilitator—Explained the self management concept and introduced the eating and physical activity messages: eat two servings of fruit each day; eat five servings of vegetables; limit high fat fast food and convenience foods, drink water in place of sweetened drinks; if hungry snack on fruit and vegetables between meals; eat breakfast every day; and aim for 8000-10 000 steps a day or 30-40 minutes of brisk walking. Small groups—Discussed realistic expectations for behaviour change, where to go for more information and resources on physical activity and diet, and personal barriers to behaviour change. Commenced goal setting. Facilitator—Introduced problem solving skills, gave examples, brainstormed possible solutions, and finished with decision making. Introduced self monitoring. Small groups—Developed individual goals, identified barriers, and practised problem solving skills. Devised a self monitoring plan and a personal action plan. Formed walking groups or planned walking opportunities. Facilitator—Reviewed problem solving and eating and physical activity messages. Introduced the concept of relapse prevention. Small groups—Reviewed action plans, practised applying skills in different situations, identified high risk times, and re-wrote personal action plans. Facilitator—Reviewed messages, behaviour skills, and action plans. Small groups—Reviewed progress and renewed personal action plans. Facilitator—Sent mobile phone text message every four weeks to reflect the agreed nutrition and physical activity messages and behaviour change strategies. Mailed one motivational A4 flyer. Follow-up support comprised mobile phone text messages—personalised by using names—sent by computer to each participant monthly from week four until week 52. The following messages, based on information delivered in group sessions, were sent sequentially: a diet related message; a physical activity message; and a behaviour change message. Participants returned for follow-up at 12 months and all measures were repeated. The control group attended a single, 30 minute, non-interactive group lecture at the school, in which they received information on the Australian Population Dietary and Physical Activity Guidelines and were provided with the accompanying population guideline brochure.14 15 The population guideline brochures are widely available and include advice to eat more fruit and vegetables, reduce saturated fats, balance eating and activity to avoid weight gain, and participate in regular moderate activity. No specific or individual advice was provided. Participants were weighed and measured at this session, and completed all baseline questionnaires. Women received a pedometer to use voluntarily but were not given specific goals. This measure was to ensure consistency across the control group because pedometers are widely available and their indiscriminate use may have been a confounding factor in physical activity outcomes. Control participants were not contacted other than via a brief mailed survey at 16 weeks, and were measured again at completion of the study. Randomisation was at the cluster level, and outcomes were measured at the individual level. The main outcome measure was weight gain at 12 months. All participants were weighed to the nearest 0.1 kg in light clothing, without shoes, and with an empty bladder on a single electronic scale (Tanita model BWB-800 digital scale; Wedderburn Scales, Melbourne, Australia) at session one and again at 12 months. Scales were calibrated before all weighing periods. Height was measured using a portable stadiometer (Mentone Education Centre, Melbourne, Australia). Waist circumference was measured to the nearest 0.5 cm at the umbilicus with a flexible tape applied directly on the skin. Hip measurements were taken at the widest point around one layer of light clothing. All measurements were performed by a trained researcher. We added cardiovascular risk end points (lipids and glucose) to support the primary outcome. A commercial pathology provider (Melbourne Pathology, Melbourne, Australia) collected and analysed fasting total cholesterol, high density lipoprotein, low density lipoprotein, triglyceride, and glucose concentrations on fresh samples. For lipids, blood samples were collected in SST tubes, allowed to clot for 30 minutes at room temperature, and centrifuged for 10 minutes at 1000 × g. Blood samples for measuring glucose concentration were collected in fluoride oxalate 10 mg/8 mg tubes and centrifuged for 10 minutes at 1000 × g. Serum lipids and plasma glucose concentrations were analysed using a Hitachi modular analyser (Roche Diagnostics, Mannheim, Germany). The validated international physical activity questionnaire, short version was used to measure usual weekly physical activity.18 19 Physical activity data were scored in metabolic equivalents, where one metabolic equivalent is equal to resting energy expenditure, and calculated as minutes a week for walking and for moderate and vigorous activity using the following metabolic equivalent levels: walking=3.3; moderate activity=4.0; vigorous activity=8.0 (metabolic equivalent level × minutes a day × days a week = MET/min/week. To provide an objective measure of physical activity, participants wore a sealed research pedometer (Yamax Digiwalker model SW-700; Yamax Corporation, Tokyo, Japan) for three to seven days before the baseline and final visits; steps recorded were averaged across full days. The pedometer was sealed to limit tampering and the possibility of feedback on step counts motivating participants to change usual activity during the data collection periods. The eating and exercise confidence scale developed by Sallis was used to measure participants’ self confidence in managing diet and physical activity on a Likert scale of one to five (with five being highest confidence).20 The consistency and reliability of this scale has been reported for both the diet and physical activity domains. The self management strategy questionnaire21 was used to measure participants’ self management strategies and includes 12 items on cognitive and behavioural strategies related to physical activity. An additional 16 similar items on diet strategies were added because there is no dietary equivalent of this questionnaire. Examples of strategies are: I think about the benefits of being active; I actively seek information about nutrition; and I make backup plans to be sure I stay active. A mean numerical score was derived for physical activity (total score divided by 12) and diet (total score divided by 16). Annual weight gain in young Australian women has been documented at 600-725 g/year.9 We estimated that 71 participants were required in each group in order to demonstrate a 600 g (standard deviation (SD) 1100) difference between the intervention group and the control group at 12 months with a power of 90% and a statistical significance of 5%. To account for the cluster design, we adjusted the sample size assuming an intracluster correlation coefficient of 0.02. No published data on intracluster correlation coefficients exist for this setting, target group, or outcome. However, studies in primary care clusters for both a general community and older adults report an intracluster correlation coefficient of less than 0.02 for weight variables.22 23 In estimating the adjusted sample size we assumed 30 mothers per cluster. After adjustment, we estimated that 110 participants a group would be required to detect at least a 600 g difference in weight between groups at 12 months. To allow for potential dropouts, we aimed to recruit 125 participants in each group. To ensure we could randomise schools in one batch and recruit the required sample size, 14 schools were invited to participate; 12 agreed and were subsequently randomised. Baseline and within group differences over time were assessed using paired Student’s t tests for continuous variables and χ2 tests for categorical variables. Between group differences at 12 months were analysed using linear regression on complete data, with the variable of interest at 12 months as the outcome variable adjusted for baseline values and the clustering effect of schools. We conducted a multivariable regression analysis on a subset of 171 women with complete data, using weight at 12 months as the outcome variable and adjusting for variables known to influence weight gain, which were baseline weight, age, income, education, and school cluster. To address potential bias created from missing data, multiple imputation was applied to primary and secondary outcome variables. Multiple imputation is a statistical technique designed to reduce the bias that can occur from missing data by allowing participants with incomplete data to be included in analyses.24 We used the predictive mean matching multiple imputation method available in Stata version 11 (Statacorp, College Station, TX), a partially parametric method, and obtained 20 imputed datasets. A univariate regression analysis was performed for each outcome variable for all 250 imputed cases, adjusted for baseline values and the clustering effect of school. We undertook an exploratory analysis to investigate the effect of self monitoring on weight change by dividing the participants into regular self weighers (daily or weekly) and non-regular self weighers (monthly, occasional, or never). Linear regression was used to estimate the association between regular self weighing and weight change. Given that the longitudinal data suggest younger women are at high risk of weight gain and that weight gain even within the healthy body mass index range increases risk, data were stratified and analysed by age and body mass index. Figure 1⇓ shows the flow of participants through the study. 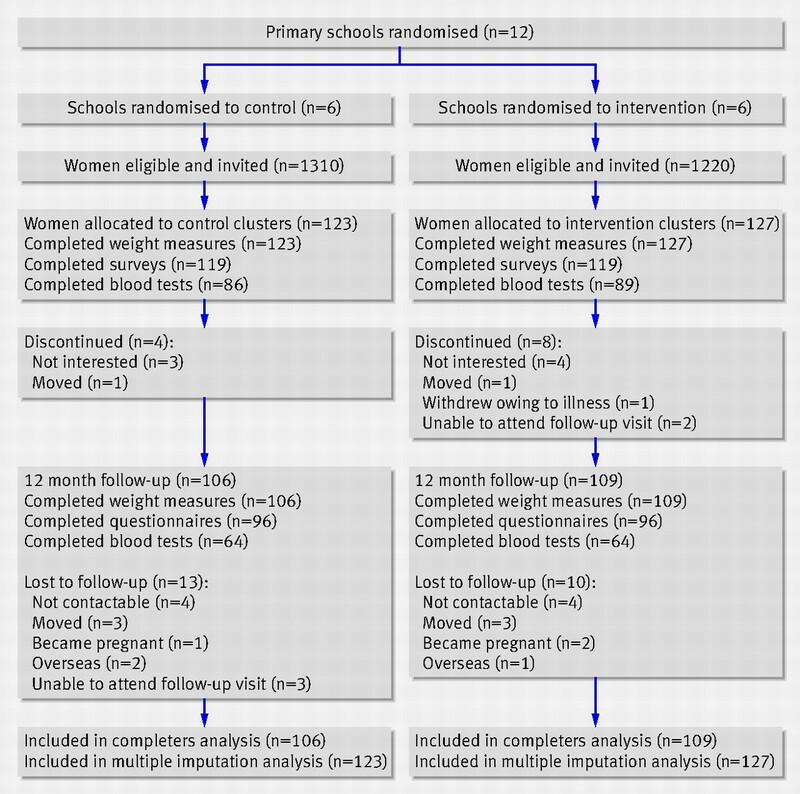 Three hundred women (12%) responded to the invitation to participate in the study, and 250 women (10%) were recruited and randomised as school clusters to the intervention (n=127) or control (n=123). The demographic and health characteristics of the intervention and control groups were similar at baseline (table 1⇓). At baseline, the cohort was ethnically diverse (26% born overseas), included single mothers (11%), had a mean age of 40.39 years (SD 4.77), a mean weight of 73.89 kg (SD 14.98), and a mean body mass index of 27.82 kg/m2 (SD 5.42). Women within the healthy weight range were included as well as overweight and obese women. Recruited participants represented a broad range of income and education levels, reflecting background Australian population levels as we have reported previously.25 No exclusions were made on the basis of physical or psychological disorders. Women with diagnosed diabetes or lipid disorders or who were taking medication for these disorders were excluded from biological analyses. Women who became pregnant during the study period were excluded from all analyses. Baseline characteristics by school cluster are reported in web appendix A. A total of 215 women, 106 (86%) from the control group and 109 (86%) from the intervention group, completed final weight measures. Analysis of the data found only small baseline differences between those who returned final weight measures and those who did not (table 2⇓), supporting both the assumption that data were missing at random and the use of multiple imputation. Differences in income were noted between women who returned for final weight measurement and those who did not, although participants were given a “prefer not to answer” option for income that led to a high number of missing values for this variable. We report the extent and characteristics of missing data for variables of interest in the flow chart (figure 1⇑) and in web appendix B. The mean weight gain in the control group was 0.83 kg (95% confidence interval (CI) 0.12 to 1.54). Weight gain was not observed in the intervention group (−0.20 kg, 95% CI −0.90 to 0.49). The difference in weight change between the intervention group and the control group at 12 months, on the basis of observed values adjusted for baseline weight and school cluster, was significant at −1.13 kg (95% CI −2.03 to −0.24; P<0.05). After multiple imputation to account for missing values, the estimated difference in weight change between the two groups was still statistically significant (−1.11 kg, 95% CI −2.17 to −0.04; table 3⇓). After adjusting for baseline weight, age, income, education, and clustering in the multivariable analysis, the estimated effect size was still significant (−0.99 kg, 95% CI −1.9 to −0.08; n=171). Stratification of participants on the basis of baseline body mass index and age revealed different trends in weight change. Young control participants (aged <40 years) with a body mass index of 18-24.9 kg/m2 seemed to have gained the most weight (1.72 kg, 95% CI 0.45 to 2.99), in contrast to the young intervention participants (−0.72 kg, 95% CI −2.54 to 1.08). Figure 2⇓ shows a box plot of weight change over the study period according to the 12 school clusters. 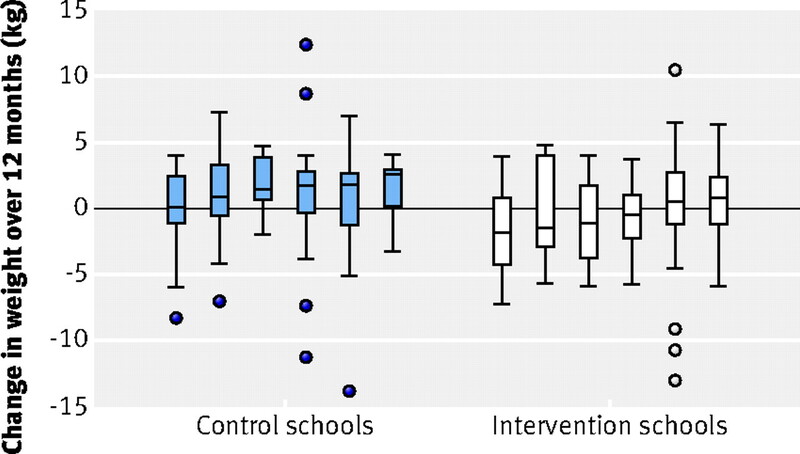 The plot shows a trend towards weight loss in the intervention school clusters and weight gain in the control clusters. The observed intracluster correlation coefficient calculated using generalised estimating equations was −0.02 and thus interpreted as effectively zero. Analyses for all secondary outcome variables for both the control group and the intervention group are presented in tables 4⇓, 5⇓, and 6⇓. The difference between groups is reported for complete cases, where data are available at both baseline and 12 months, and for the entire dataset, using multiple imputation for missing values. The control group showed a significant increase in total cholesterol concentration (0.19 mmol/l, 95% CI 0.04 to 0.34; P=0.01) and low density lipoprotein cholesterol concentration (0.32 mmol/l, 95% CI 0.18 to 0.45; P<0.001) at the end of the 12 month study period, and a decrease in the concentration of high density lipoprotein (−0.10 mmol/l, 95% CI −0.16 to −0.03; P=0.004), with little change in fasting glucose concentration (−0.003 mmol/l, −0.14 to 0.13; P=0.95; table 4⇑). In contrast, the intervention group showed small non-significant changes in total cholesterol concentration (−0.02 mmol/l, 95% CI −0.20 to 0.16; P=0.83), low density lipoprotein concentration (0.12 mmol/l, 95% CI −0.05 to 0.30; P=0.16, and fasting glucose concentration (−0.11 mmol/l, 95% CI −0.25 to 0.02; P=0.08), and a significant decrease in the concentration of high density lipoprotein (−0.09 mmol/l, 95% CI −0.14 to −0.03; P=0.002). After multiple imputation, the intervention group had a significantly lower cholesterol concentration than the control group at 12 months (−0.35 mmol, 95% CI −0.70 to −0.001; P=0.05). At 12 months, participants in the intervention group had increased the amount of vigorous activity they did (400.00 MET/min/week, 95% CI 121.00 to 678.99; P=0.005), but, as expected, there was little change in vigorous activity in the control group (42.50 MET/min/week, 95% CI −135.17 to 220.18; P=0.63; table 5⇑). Although women in the intervention group reported an increase in moderate and vigorous activity from baseline, the average amount of walking they did decreased (−84.97 MET/min/week, 95% CI −356.58 to 186.63). The intervention group and the control group reported a similar significant reduction in energy intake (−559 kJ/day, 95% CI −940 to −178; P=0.004 v −570 kJ/day, 95% CI −996 to −143; P=0.009, respectively). The two groups also had a similar reduction in total intake of fat (−8.22 g/day, 95% CI−13.39 to −3.05; P=0.002 and −7.34 g/day, 95% CI −12.43 to −2.26; P=0.005 for the intervention and control group, respectively) and saturated fat (−3.29 g/day, 95% CI −5.50 to −1.08; P=0.004 and −3.66 g/day, 95% CI −5.88 to −1.44; P=0.001, respectively). Women in the intervention group used more self management strategies to control diet and physical activity over the 12 month study period than did those in the control group (diet: 0.25, 95% CI 0.17 to 0.33; P<0.001 v 0.06, 95% CI –0.02 to 0.14; P=0.14; physical activity: 0.37, 95% CI 0.26 to 0.49; P<0.001 v 0.10, 95% CI −0.04 to 0.25; P=0.16). After multiple imputation for missing values, the difference between groups was 0.18 for diet (95% CI 0.03 to 0.33; P=0.02) and 0.24 for activity (95% CI 0.05 to 0.43; P<0.001; table 6⇑). At 12 months, participants in the intervention group were also more confident they could control their weight than were those in the control group (P=0.01). Regular self weighing was associated with weight loss in the intervention group (−1.11 kg, SD 3.96) but not in the control group (0.88 kg, SD 4.66; a difference of −1.99 kg, 95% CI −3.75 to −0.23; P=0.03). Failure to regularly self weigh was associated with weight gain in both the intervention group and the control group (0.62 kg and 0.78 kg, respectively), with no difference between groups (−0.16 kg, 95% CI −1.23 to 0.90). This community based, cluster randomised trial suggests that a low intensity self management intervention may prevent excess weight gain in women. Participants in the intervention group experienced no weight gain over 12 months, unlike those in the control group, who gained weight as anticipated. The difference in weight gain between the two groups remained significant after we adjusted for possible confounding factors and after we addressed the potential bias created from missing values. The single information session attended by the control group may have motivated some control participants to lose weight, in which case the weight difference reported underestimates the true effect of the intervention. Given this issue, it would seem that information based on population guidelines alone is not effective in preventing weight gain in women. The high observed weight gain in the younger control women is concerning.3 Longitudinal studies estimate weight gain in young Australian women to be 650 g a year on average,9 yet women in the control group of our study gained an average of 830 g a year. Women with children are a group at particularly high risk, reporting major barriers to obesity protective behaviours such as regular physical activity. This factor might explain the slightly higher weight gain in the control group relative to the general population. These findings highlight a high risk group that presents a significant public health challenge. The unfavourable changes to lipid profiles in the control group are notable in the context of the small weight gain and reflect our poor understanding of the true risk of cardiovascular disease in young women. Lipid levels increased in the control group despite a self reported decrease in total fat and saturated fat intake over the past 12 months, but this finding may reflect a lack of sensitivity of the dietary measurement tool to detect small changes. The need for awareness of both the short and the long term risk of cardiovascular disease in young adults was highlighted in a recent review, where even one elevated traditional risk factor carried a lifetime cardiovascular disease risk of 39-70%.32 The results from our study suggest that women with young children would benefit from targeted health messages specific to the prevention of cardiovascular disease. There was an observed increase in moderate and vigorous activity in the intervention group, but this increase appeared to be at the expense of walking. Women might incorrectly believe they need to participate in vigorous activity to control their weight, which for many is not sustainable long term. In addition, the higher than expected baseline daily pedometer steps combined with the continued weight gain in the control group suggest that the intensity of physical activity in this sample was low but the activity was performed for long periods, possibly associated with caring for children and household chores. As such, the levels of physical activity in our sample might not meet population recommendations. This caveat might have implications for development of physical activity guidance in this population. Established cognitive behavioural strategies were selected for this intervention. The improvements in self management behaviours from baseline in the intervention group suggest that there was uptake of the behavioural skills taught during group sessions. The time allocated to teaching these skills was less than that described in intensive behavioural interventions.33However, the adjustment to behaviour and energy balance necessary to prevent weight gain is small compared with that needed to treat obesity,34 justifying the use of a low intensity intervention. This is encouraging for future community programmes with limited resources. In addition, reminding participants to engage in healthy behaviours consistently throughout the year through text messages was simple and low cost. Continued patient-practitioner contact, on site or by email, has been associated with weight loss,36 but to our knowledge text messaging has not been tested previously in this context. We also used the observed social connections between mothers often found in the school setting to provide social support for behaviour change; this strategy could have enhanced participation and adherence through peer persuasion. Finally, we adapted the intervention delivery to local contexts by engaging school leaders and personalised the content by allowing participants to have input into the delivery. For example, participants assessed their own needs, developed personal goals, and prioritised the relevant health behaviours. We addressed possible barriers to participation by delivering sessions in schools, a convenient local setting, and we avoided the prescriptive energy intake and expenditure goals, and the extensive weekly attendance, frequently used in weight loss interventions. Self weighing is simple and provides instant feedback on small weight changes, which can then be countered by relatively small adjustments to behaviour. It is possible that the women in our study applied the intervention skills more effectively or more consistently when they self weighed. How self weighing reinforces behaviour change is yet to be determined. There is a general concern that a focus on weight via repeated self weighing might result in a disproportionate negative reaction among people trying to avoid weight gain, which is counterproductive. However, Jeffrey and French found no increase in unhealthy eating behaviours with regular self weighing.39 The interaction of various forms of self monitoring with intervention components in different populations needs further investigation. Despite the observed need, there are few other reports of interventions designed specifically to prevent weight gain in the general community.5 40 Previous reports describe mixed success using low intensity mail based programmes or more intensive clinic based programmes. The Minnesota Heart Health programme was a long term community project where the population trend towards weight gain exceeded the effectiveness of the education strategies in the intervention.41 The project addressed multiple risk factors concurrently using screening, awareness, and education, unlike the HeLP-her programme, which addressed weight gain prevention and focused on self management, skill development, and support rather than education. The Pound of Prevention study was unable to demonstrate a weight difference between groups over 3 years using a monthly newsletter and optional support activities.39 The messages delivered were general, similar to HeLP-her, but unlike our study there was no personal contact and less specific or personalised behaviour change information. The Weigh-to-Be weight loss study was also unable to induce weight loss using low intensity mail or phone interventions.8 Behavioural change strategies were included in the interventions, but there was no face to face contact with facilitators or interaction between participants. In contrast, an intensive behavioural programme in perimenopausal women was successful in preventing weight gain,42 but this approach used 15 sessions in the first 20 weeks, ongoing refresher courses, individual diet and exercise advice, mail follow-up, and telephone follow-up. This level of intensity is not deemed feasible to prevent weight gain in the general population. Hence the current study shows that a combination of personal contact and remote follow-up might achieve the desired intensity, population reach, and cost effectiveness required for successful outcomes in a community setting. The strengths of the study were the robust design and analysis, the high retention rates, the use of objective measures, and the recruitment of a sample large enough to detect a weight difference in groups. Follow-up of participants over a number of years would strengthen our results. In the context of population reach, we targeted women unselected in terms of health risks who were representative of Australian women. The reach of the intervention is extended when we consider the important influence mothers have on family health behaviours.43 We intentionally kept the inclusion criteria broad, recruited and implemented the programme in a real life setting, and selected a community of moderate socioeconomic disadvantage to strengthen the generalisability of our study. The programme could be translated to other communities and settings providing there is appropriate attention to implementation issues, such as a focus on community and stakeholder needs, maximising intervention acceptance by the community, and adapting delivery to the local context. The potentially confounding influence of mismatches in socioeconomic status across schools was addressed by choosing a single community and randomising by school. Baseline data indicate that the possibility of bias was largely addressed through randomisation, with only a small difference noted between recruited groups. Adjusting for income and education did not change the results. It is possible that other subtle socioeconomic differences within and between schools may have influenced the outcomes. In particular, the influence of school social cohesion—that is, the connections between the parents and the school—might need to be investigated further. A limitation of the study was the 12% response rate and the 10% participation rate of mothers, which affects external validity. The recruitment rate is comparable to that of other community programmes that target the general population and use similar broad inclusion criteria. The Minnesota community studies, for example, enrolled 16% of invited employees in a work based intervention and 4% of invited households into a mail based weight loss programme.44 In the Weigh-to-Be weight loss programme, only 10% of the invited clinic members showed interest in joining the programme after direct mail out to all households.8 Many community interventions do not report the total population exposed to recruiting materials, particularly when using broad reaching recruitment methods such as newspapers. We deliberately kept the recruitment strategy simple to reflect a realistic and repeatable approach for recruitment of young women into studies of health interventions. The response to recruitment of the schools and individuals was positive overall considering the simple recruiting methods used. More vigorous recruiting may have increased participation. Women volunteered for this study and, therefore, might have been more motivated than those in the general population. The fact that the control group gained weight at a similar rate to the population, however, mitigates the suggestion of recruitment bias. Finally, the study was not powered to detect differences in biochemical parameters; therefore, the biochemical results should be interpreted with care. Our findings suggest that excess weight gain in women may be prevented by using a low intensity community based programme that promotes self management and includes personal contact with ongoing remote support. In contrast, a single information session based on generic population guidelines for eating and physical activity is not effective for preventing weight gain in this population. The HeLP-her intervention potentially bridges the gap between intensive treatment programmes and broad population health strategies. In future, the intervention could be adapted to local needs, settings, and populations, particularly those with a social connection, such as work places and community groups. Given that this programme targeted mothers, it could be integrated with childhood obesity programmes, community programmes, or environmental change programmes to provide a multi-level approach to obesity prevention. The programme contributes much needed evidence for the successful prevention of weight gain and has important population health implications in a setting where there is a strong need to prevent the rising epidemic of obesity. We thank Melanie Gibson-Helm, who assisted with data collection and entry, Eldho Paul, who provided statistical advice, and Janet Michelmore, who assisted in securing funding. We also thank participating schools and the women who took part in this study, and Melbourne Pathology for the collection and analysis of blood samples. Contributors: CL, HT, and DJ designed the study. CL and DJ analysed the results. KB and AD contributed to the psychological and behavioural aspects of the intervention and contributed to the interpretation of results and drafts of this paper. CL was responsible for the study design, recruiting schools and participants, delivering the intervention, arranging and supervising collection of data, analysing the data, and writing the manuscript. HT supervised CL and provided intellectual input into all aspects of the study design and data collection, analysis, and reporting. All authors interpreted the results and contributed to writing revisions and approved the final manuscript. Funding: HT is supported by a National Health and Medical Research Council Research Fellowship (ID 545888), KB is funded by a National Health and Medical Research Council Senior Research Fellowship (ID 479513), and CL was awarded a PhD scholarship by VicHealth, Victoria, Australia and a postgraduate writing award by Monash University, Melbourne, Australia. Research costs were funded by a project grant from the William Buckland Foundation, Melbourne, Australia. The researchers were independent of the funder. The organisation responsible for funding had no role in the design or conduct of the study, or in collection, analysis, and interpretation of data or preparation, review, or approval of this manuscript. The authors had full access to all data and had final responsibility for the decision to submit for publication. Competing interests: All authors have completed the Unified Competing Interests form available at www.icmje.org/col.pdf (available on request from the corresponding author) and declare that: 1) HT is supported by a National Health and Medical Research Council Research Fellowship (ID 545888), KB is funded by a National Health and Medical Research Council Senior Research Fellowship (ID 479513), and CL was awarded a PhD scholarship by VicHealth, Victoria, Australia and a postgraduate writing award by Monash University, Melbourne Australia. All authors declare: (2) no financial relationships with commercial entities that might have an interest in the submitted work; (3) no spouses, partners, or children with relationships with commercial entities that might have an interest in the submitted work; and (4) no non-financial interests that may be relevant to the submitted work. Ethical approval: Approval was granted by the Southern Health Human Research Ethics Committee 05187C. All participants signed consent before participation. Barr E, Magliano D, Zimmet P. The Australian Diabetes Obesity and Lifestyle Study. 2005. www.diabetes.com.au/pdf/AUSDIAB_Report_Final.pdf. Kelly T, Yang W, Chen C-S, Reynolds K, He J. Global burden of obesity in 2005 and projections to 2030. Int J Obes2008;32:1431-7. Diabetes Prevention Program Research Group. The Diabetes Prevention Program (DPP): description of lifestyle intervention. Diabetes Care2002;25:2165-71.
WHO. Obesity: preventing and managing the global epidemic. 2000. www.who.int/nutrition/publications/obesity/WHO_TRS_894/en/index.html. Lombard CB, Deeks AA, Teede HJ. A systematic review of interventions aimed at the prevention of weight gain in adults. Public Health Nutrition2009;12:2236-46. Elmer PJP, Obarzanek EP, Vollmer WMP, Simons-Morton DMDP, Stevens VJP, Young DRP, et al. Effects of comprehensive lifestyle modification on diet, weight, physical fitness, and blood pressure control: 18-month results of a randomized trial. Ann Intern Med2006;144:485-95. Sherwood NE, Jeffery RW, Pronk NP, Boucher JL, Hanson A, Boyle R, et al. Mail and phone interventions for weight loss in a managed-care setting: Weigh-to-Be 2-year outcomes. Int J Obes2006;30:1565-73. Women’s Health Australia. Australian women and their weight—a growing problem. 2005. http://www.alswh.org.au/Reports/Achievements/achievements-weight.pdf. Trost S, Sallis J, Pate R, Freedson P, Taylor W, Dowda M. Evaluating a model of parental influence on youth physical activity. Am J Prev Med2003;25:277-82. Gorin AA, Wing RR, Fava JL, Jakicic JM, Jeffery R, West DS, et al. Weight loss treatment influences untreated spouses and the home environment: evidence of a ripple effect. Int J Obes2008;32:1678-84. Australian Bureau of Statistics. Socio-economic indexes for areas (SEIFA). 2006. www.abs.gov.au/AUSSTATS/abs@.nsf/DetailsPage/2039.0.55.0012006?OpenDocument. Bandura A. The explanatory and predictive scope of self-efficacy theory. J Soc Clin Psychol1986;4:359-73. Australian Government. Food for health: dietary guidelines for Australian adults. 2003. http://www.nhmrc.gov.au/_files_nhmrc/file/publications/synopses/n29.pdf. Australian Government. National physical activity guidelines for adults. 2005. http://www.health.gov.au/internet/main/publishing.nsf/Content/BC3101B1FF200CA4CA256F9700154958/$File/adults_phys.pdf. FSANZ. Nutrient data table for use in Australia. 2006. http://www.foodstandards.gov.au/consumerinformation/nuttab2006/. Hodge A, Giles G. The Anti-Cancer Council Victoria FFQ: relative validity of nutrient intake compared with weighed food records in young to middle-aged women in a study of iron supplementation. Aust N Z J Public Health2000;24:576-83. IPAQ. International Physical Activity Questionnaire. 2005. www.ipaq.ki.se/ipaq.htm. Hallal PC, Victora, CG. Reliability and validity of the International Physical Activity Questionnaire (IPAQ). Med Sci Sports Exerc2004;36:556. Sallis JF. The development of self efficacy scales for health-related diet and exercise behaviors. Health Educ Res 1988;3:238-92. Saelens BE, Gehrman CA, Sallis JF, Calfas KJ, Sarkin JA, Caparosa S. Use of self-management strategies in a 2-year cognitive-behavioral intervention to promote physical activity. Behav Ther2000;31:365-79. Smeeth L, Ng ES-W. Intraclass correlation coefficients for cluster randomized trials in primary care: data from the MRC trial of the assessment and management of older people in the community. Control Clin Trials2002;23:409-21. Parker DR, Evangelou E, Eaton CB. Intraclass correlation coefficients for cluster randomized trials in primary care: the cholesterol education and research trial (CEART). Contemp Clin Trials2005;26:260-7. Sterne JAC, White IR, Carlin JB, Spratt M, Royston P, Kenward MG, et al. Multiple imputation for missing data in epidemiological and clinical research: potential and pitfalls. BMJ2009;338:b2393. Lombard C, Deeks A, Jolley D, Teede H. Preventing weight gain: the baseline weight related behaviors and delivery of a randomized controlled intervention in community based women. BMC Public Health2009;9:2. Davies M J, Heller S, Skinner T C, Campbell MJ, Carey ME, Cradock S, et al. Effectiveness of the diabetes education and self management for ongoing and newly diagnosed (DESMOND) programme for people with newly diagnosed type 2 diabetes: cluster randomised controlled trial. BMJ2008;336:491-5. Shaw K, O’Rourke P, Del Mar C, Kenardy J. Psychological interventions for overweight or obesity. Cochrane Database Syst Rev2005;2:CD003818. Willett WC, Manson JE, Stampfer MJ, Colditz GA, Rosner B, Speizer FE, et al. Weight, weight change, and coronary heart disease in women. Risk within the “normal” weight range. JAMA1995;273:461-5. Resnick HE, Valsania P, Halter JB, Lin X. Relation of weight gain and weight loss on subsequent diabetes risk in overweight adults. J Epidemiol Community Health2000;54:596-602. Colditz GA, Willett WC, Stampfer MJ, Manson JE, Hennekens CH, Arky RA, et al. Weight as a risk factor for clinical diabetes in women. Am J Epidemiol1990;132:501-13. Van Dam RM, Li T, Spiegelman D, Franco OH, Hu FB. Combined impact of lifestyle factors on mortality: prospective cohort study in US women. BMJ2008;337:742-9. Berry JD, Liu K, Folsom AR, Lewis CE, Carr JJ, Polak JF, et al. Prevalence and progression of subclinical atherosclerosis in younger adults with low short-term but high lifetime estimated risk for cardiovascular disease: The Coronary Artery Risk Development in Young Adults Study and Multi-Ethnic Study of Atherosclerosis. Circulation2009;119:382-9. Wadden TA, Berkowitz RI, Womble LG, Sarwer DB, Phelan S, Cato RK, et al. Randomized trial of lifestyle modification and pharmacotherapy for obesity. N Engl J Med2005;353:2111-20. Hill JO. Understanding and addressing the epidemic of obesity: an energy balance perspective. Endocr Rev2006;27:750-61. Wing RR, Papandonatos G, Fava JL, Gorin AA, Phelan S, McCaffery J, et al. Maintaining large weight losses: the role of behavioral and psychological factors. J Consult Clin Psychol2008;76:1015-21. Wadden TA, Butryn ML, Wilson C. Lifestyle modification for the management of obesity. Gastroenterology2007;132:2226-38. VanWormer J, French S, Pereira M, Welsh E. The impact of regular self-weighing on weight management: a systematic literature review. Int J Behav Nutr Phys Act2008;5:54. VanWormer JJ, Martinez AM, Martinson BC, Crain AL, Benson GA, Cosentino DL, et al. Self-weighing promotes weight loss for obese adults. Am J Prev Med2009;36:70-3. Jeffery RW, French SA. Preventing weight gain in adults: The Pound of Prevention Study. Am J Public Health1999;89:747-51. Lemmens V, Oenema A, Klepp K, Berg H, Brug J. A systematic review of the evidence regarding efficacy of obesity prevention interventions among adults. Obes Rev2008;9:446-55. Luepker RV, Murray DM, Jacobs DR Jr, Mittelmark MB, Bracht N, Carlaw R, et al. Community education for cardiovascular disease prevention: risk factor changes in the Minnesota Heart Health Program. Am J Public Health1994;84:1383-93. Simkin-Silverman LR, Wing RR, Boraz MA, Kuller LH. Lifestyle intervention can prevent weight gain during menopause: results from a 5-year randomized clinical trial. Ann Behav Med2003;26:212-20. McLean N, Griffin S, Toney K, Hardeman W. Family involvement in weight control, weight maintenance and weight-loss interventions: a systematic review of randomised trials. Obes Rev 2003;27:987-1005. Jeffrey R. Minnesota studies on community-based approaches to weight loss and control. Ann Intern Med1993;119:719-21.